ON THE PATUXENT RIVER | First mapped by John Smith in 1608, Maryland’s serene Patuxent River now is being carefully photographed to create a virtual map that can be accessed via smartphones and computers. Today’s high-tech mapping of the Patuxent is part of a project to create a virtual tour of the 3,000-mile Captain John Smith Chesapeake National Historical Trail, which the nonprofit Chesapeake Conservancy has undertaken with Ryan Abrahamsen of Terrain360. Since 2012 his company, Terrain360, has specialized in creating 360-degree views of trails and parks, and has produced virtual tours of nature attractions in California, Utah, Georgia, Maine, Pennsylvania, Virginia — and now Maryland. To photograph and document the river, Mr. Abrahamsen has built a watercraft that supports a tower with six fisheye-lensed cameras. As he travels the length of the waterway, a computer program he has designed monitors and synchronizes the cameras when they take photos. Users accessing Terrain360.com are treated to a virtual reality of some of the nature preserves around the country, “walking” a trail or “sailing” down a river by moving their mobile devices left or right. Desktop computers allow users to explore all aspects of the documented trails. Jody Couser of the Annapolis-based Chesapeake Conservancy said that creating a vivid, easily accessed presentation of the Chesapeake Bay watershed is a key component of the group’s conservation efforts. 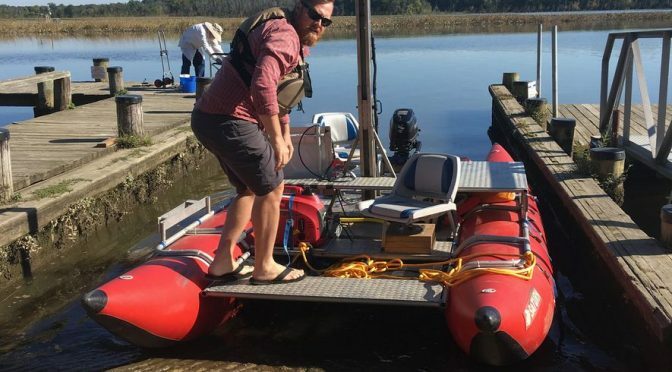 “A few years ago we started this project to try to connect people — at least virtually — to the Chesapeake Bay’s great rivers, because we know that you’re not going to help protect the Chesapeake and fight for it and try to restore the Chesapeake if you’re not familiar with it,” Ms. Couser said. Terrain360’s views of the Patuxent are also available on the Chesapeake Conservancy’s web site. The conservancy is conducting several projects that monitor and map key areas to sharpen understanding of conservation needs such as water quality, fish survey count, land use and conservation. Other programs to engage the public include the webcams that are placed in the nests of ospreys, great blue herons and peregrine falcons. Of its virtual tours, one of the conservancy’s most frequently visited sites is Mallow’s Bay, famous for its “ghost ships” — a veritable graveyard of destroyed seacraft, many from World War I, that were built quickly and in excess, Ms. Couser said. Ms. Couser and Mr. Abrahamsen said the virtual tours are useful tools for people to research or plan a visit. Stretching some 115 miles from the Piedmont region to the bay, the Patuxent is the longest river completely within Maryland’s borders. It separates Montgomery, Prince George’s, Charles and St. Mary’s counties on its west side from Howard, Anne Arundel and Calvert counties on its east. John Smith, who helped settle Jamestown, Virginia, explored part of the Patuxent and the Chesapeake with the aid of American Indians, and created maps that were used by travelers and traders for hundreds of years. For these ten days in 2017, all national parks across the country will waive admission fees, so grab your calendar and start making plans. It might be a little cold out to take a real cruise down the Potomac River, but a new virtual tour can remind you of the waterway’s beauties from your own home. As yet another new year beckons (entirely too quickly for our liking) we may be reflecting on the things we have made this year but also on what we aspire to in the coming year. Ryan Abrahamsen of Terrain 360 is trying to give the Potomac river a “street” view, taking a small boat out on the river to capture sweeping views of the outdoors. WASHINGTON — The Chesapeake Conservancy has teamed up again with a Richmond virtual tour company to map and record 92 miles of the Patapsco River, including Baltimore’s Inner Harbor. The virtual footage includes 360-degree views of the river and follows the Captain John Smith Chesapeake National Historic Trail. After traversing the Susquehanna River last summer, Terrain360 decided its small boat with lots of cameras was ready for urban waters this year.